P.S. Bonus points for the first commenter to find another glaring inaccuracy in the packaging picture. This post is filed under Cheese, Frozen, Jack's, Oven, Pepperoni, Pizza. That pizza cannot be one pound. Give me a break. Well, the biggest inaccuracy i see is that it says that it’s 3 servings! On second thought, it’s probably accurate, as i doubt anyone would want to choke down more than two slices of this in a sitting. 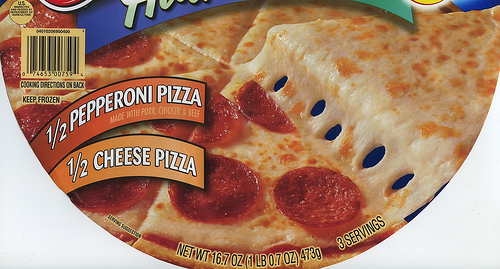 Another glaring inconsistency on the box is that the slice being lifted seems to be much larger than the other slices. You can see the cut side of the lifted slice doesn’t line up at all to what should be the continuing cut across the pizza. Nice catch, I hadn’t noticed that. Something is definitely amiss. You win! There’s no way that happens without some intervention. Where’s the other half of that pepperoni slice on the box? It has to be that more than half the pizza on the photo is cheese… one of the cut lines isn’t straight! That has to be it. And it really shows how they had a food stylist fake the picture, rather than showing an accurate representation on the box. That’s what I was going to post. Is the other inaccuracy the pepperoni that’s broken in half at the edge of the slice without the other half being on the cheese slice? 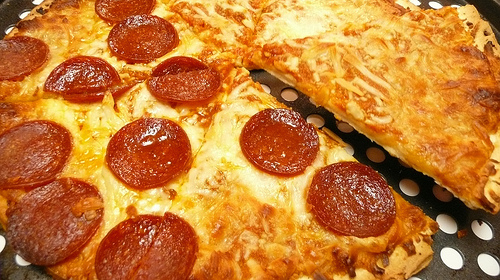 Is it that the picture shows half a pepperoni at the edge of the pepperoni side?